If you're like me, then every once in awhile, you get the urge to move things around. Changing furniture arrangements won't work here, (believe me, I've tried), so I have to change up smaller things; new vignettes, different accessories like pillows and tablerunners. 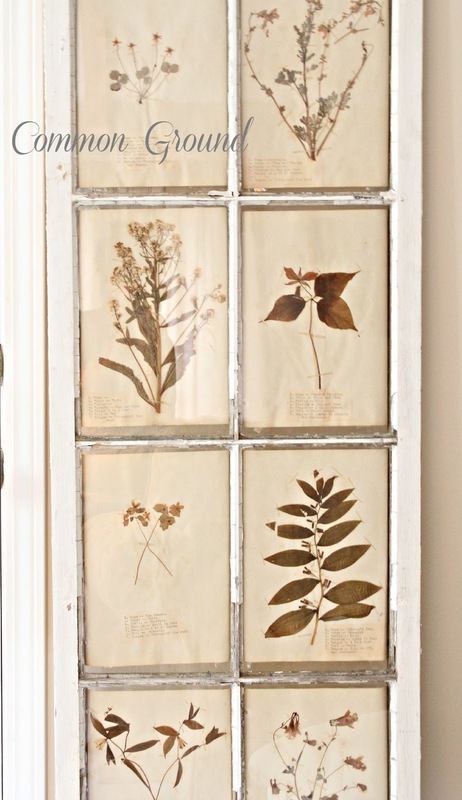 This week I had that urge, and it landed on this great old window with original botanicals that I put together a few years ago. I dragged it around the house looking for another spot for it, but when I had worn myself out, I brought it back here in the Living Room right where I found it. So I decided to share it again with all of you, since so many of you are new followers. 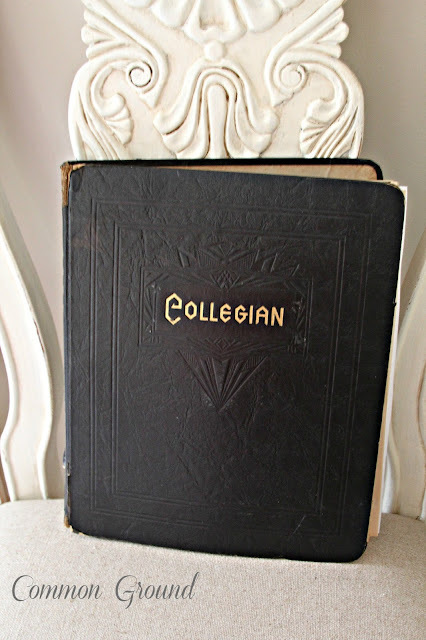 A few years ago I found a college notebook probably from sometime before the 1930's filled with these individual sheets at a local flea, and grabbed it up. They sat unused for awhile, thinking I might frame them individually. I still may do that with some, but I picked out a few for this great old window that I'd had for awhile in the garage. We have ten chairs that go with our Dining Room set; more than we could ever use. So when I was on my white painting spree a couple of years ago, I decided to go ahead and paint out two of them to flank the sofa table. There's a part of me that would love to paint the whole Dining Room set, but I just haven't been able to make that leap. Here are closeups of a few of the individual panes of glass. 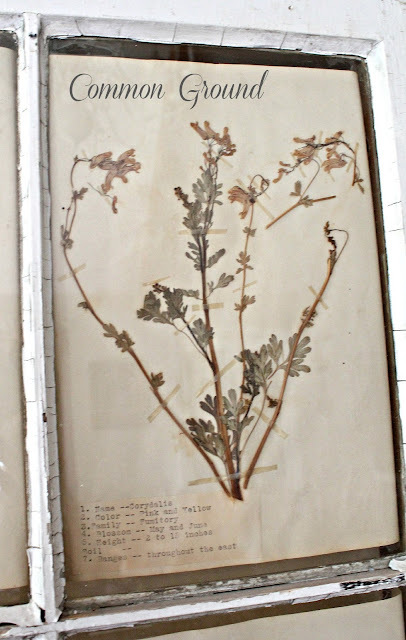 Each specimen sheet is categorized and labeled in old type and taped. Over the years they have faded to a perfect study in neutrals; delicate blossoms and stems have separated, but each one is work of art to me. This pic sort of gives you a reference idea of where it's located. Thanks for revisiting one of my "favorite finds". What treasures and such a beautiful way to display them. 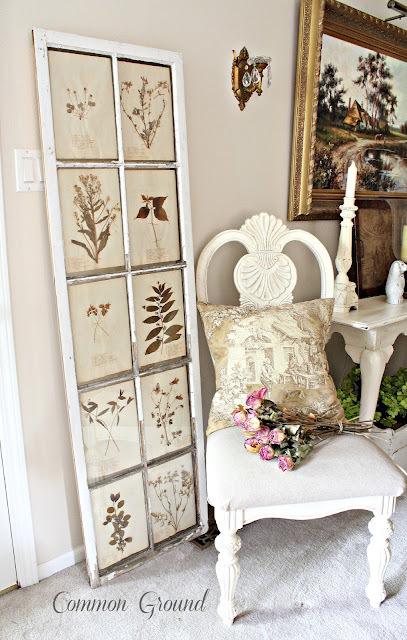 Love your vignette, so very pretty! 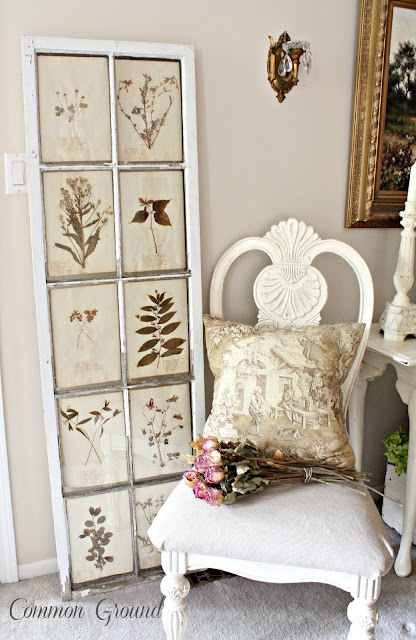 What a great size window and the botanicals suit it beautifully, Debra! I'm on the lookout for a nice window to do something similar, except with botanicals I can print out. I think this is the perfect spot for your window. I've never seen it so thanks for sharing it again. And what an awesome notebook to have! I love the whole arrangement. How beautiful! I love it, and it's in such a peaceful, serene setting. 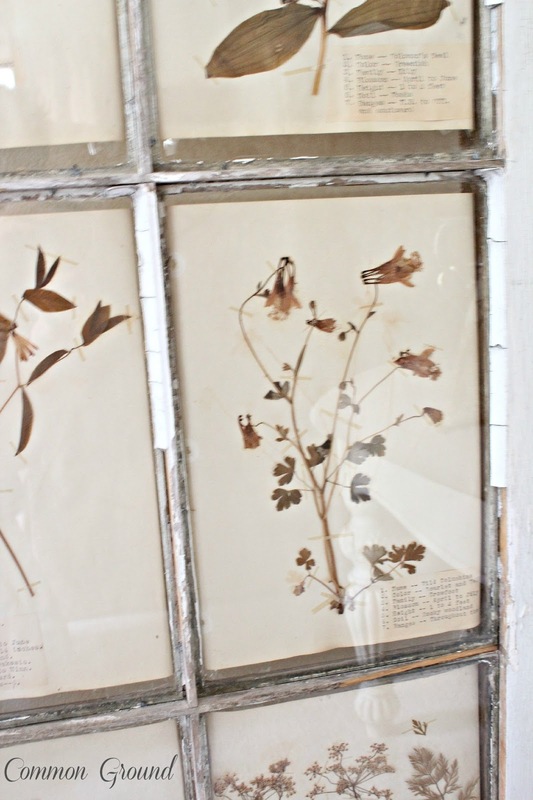 Wow, I love that window and the botanicals. I have a spot in our family room where that would be perfect! Just thought I would mention that just in case you ever get tired of it : ) Your dried roses are really pretty too! Wow Debra, that window and pillow are amazing....love them. You did a great job. I've always loved this idea. Love the prints as well. Love old windows! Love botanical's! Put them together...stunning! It is perfect in that spot - boy is that ever neat. I have two window panels about that size, have had it stored for over ten years. 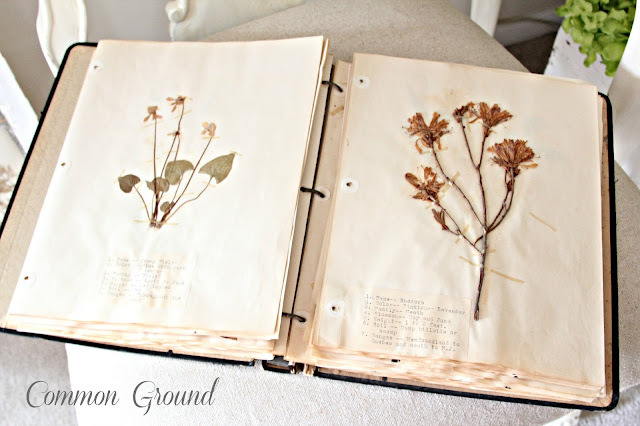 I was actually planning on doing the same thing - finally found 4 gorgeous old botanical prints, not the real deal like your awesome ones.....and they were accidentally sold at our last garage sale. It doesn't pay to proscrastinate. Ugh, I had almost forgotten about that, I was so upset. Although I've seen smaller windows made over like this, yours is the first larger one I've seen. And it is fabulous! 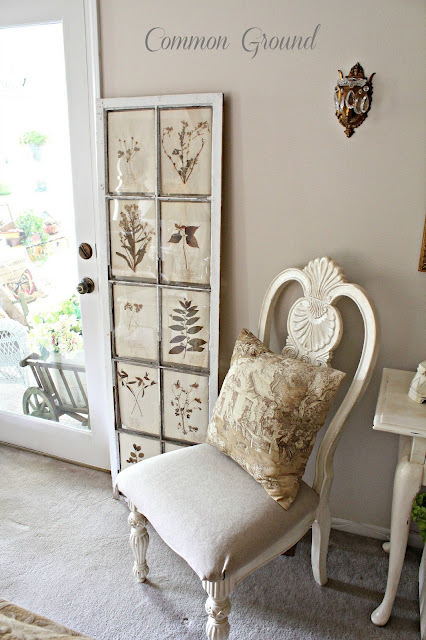 What a great idea for an old French door as well. So pretty. Hi Debra, I love your botanical window. That college note book was a great find and you had the perfect idea how to use them. I don't blame you for not being able to part with some of the pages. They'd be difficult to replace. Sometimes furniture and larger accessories have just found their perfect place. I can't move around a lot here either. There are still always smaller things that can change places for a fresh new look. 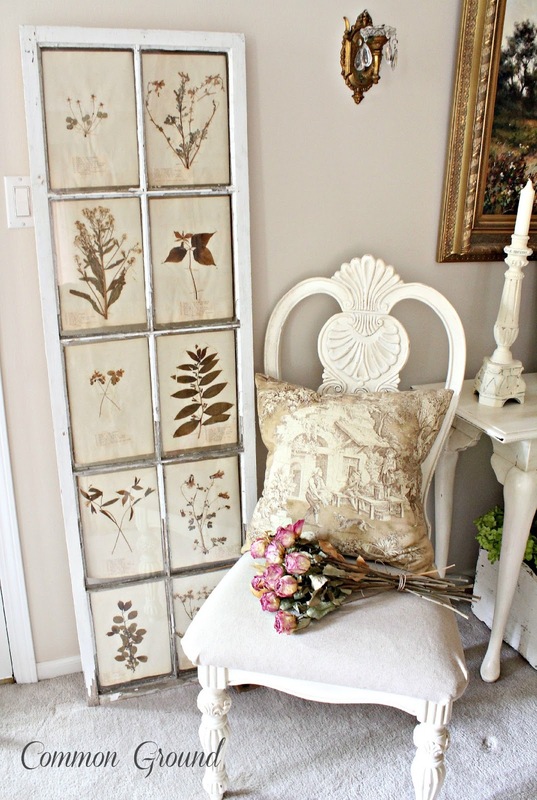 Love your botanical window...so pretty!! 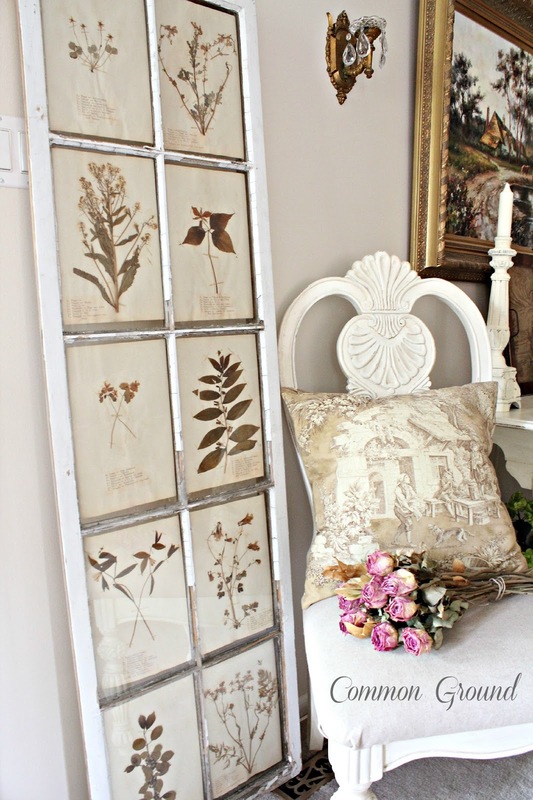 Oh the window frame is a stunner - especially how you have used it to frame the beautiful botanicals. What a precious find that old book was. Your birthday rose bouquet still looks like it was picked yesterday - the pink is still so vibrant, did you soak the stems in gylcerine? I'm visiting from Blissful Whites. 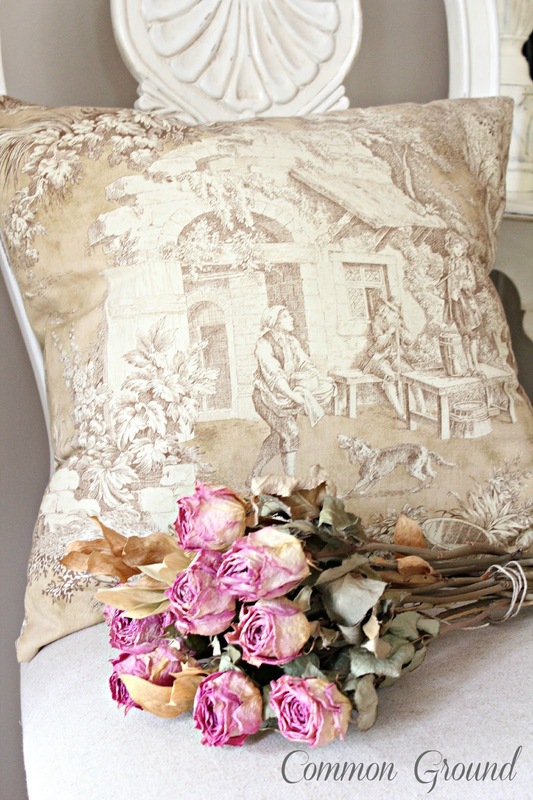 Vignettes like this make a house a home....love it! What a beautiful display! I curious about painting your dining room chairs. What did you use to paint them? My dining needs refinishing and I might just take a chance and paint it! Oh this is wonderful, truly beautiful. Such a beautiful piece. So serene - love those restful home elements. Never tire of seeing your gorgeous decor, dear friend!!! P l e a s e think of investing in a two~step ladder!!! Keep those photos coming, just be safe in the process!!! I remember this...and still love it! That is a perfect spot for it! Love love love the size of that window and great patina as well. And of course, the creative owner adding her own personal touches is what really makes it a winner in my book. Thanks for sharing. Just had to stop by, you have been on my mind a lot lately and I am glad to see you doing what you do best - creating and inspiring. I love how gorgeous and unique this is! So pretty. Thank you for linking up!! The pages are mini pages of art. I could not part with them either. Ok, That has to be one of the most fabulous things i have ever seen. The pages are wonderful, you must just love them... and to put them in the old window is so clever! Why haven't i thought of something like that!!!? I'm so glad you reshared this post! OH i just love this and it reminds me an old book that my grandmother used to have...I remember looking through it as well as her bird book. I love anything with a window in it but this is over the top beautiful! I sure would never part with any of those prints either!! What a find that book was! That is the prettiest window ever! I don't think I could ever put something like that away. 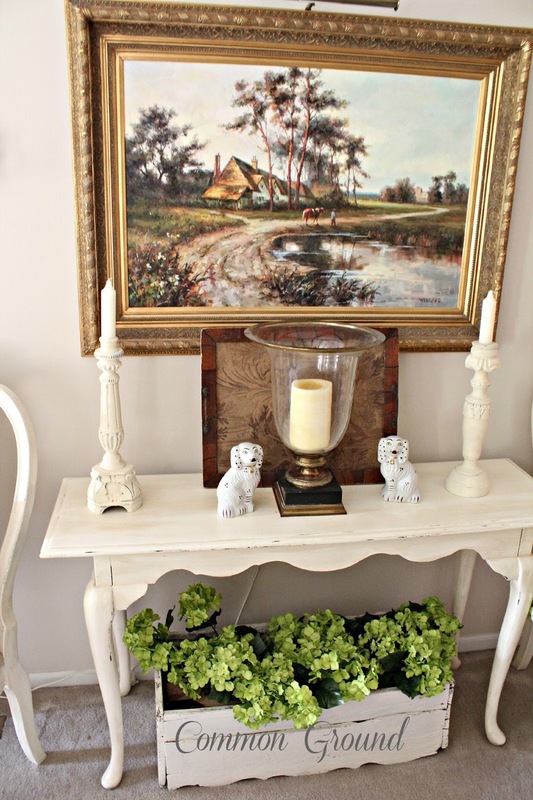 Debra, Thanks for sharing your beautiful vignette at the Open House party. I love your botanical window and the prints are fabulous. Absolutely gorgeous!! I am so glad I saw this. I am hosting a giveaway via Arcadian Home on my blog. It would be great if you could stop by. Have a lovely day! Everything about this room is just beautiful! The prints on the old window simply gorgeous! The whole room seems very peaceful, but that window with the prints is stunning. Deb, you cracked me up when you said you were standing on the sofa to get the picture... a true blogger!!!! 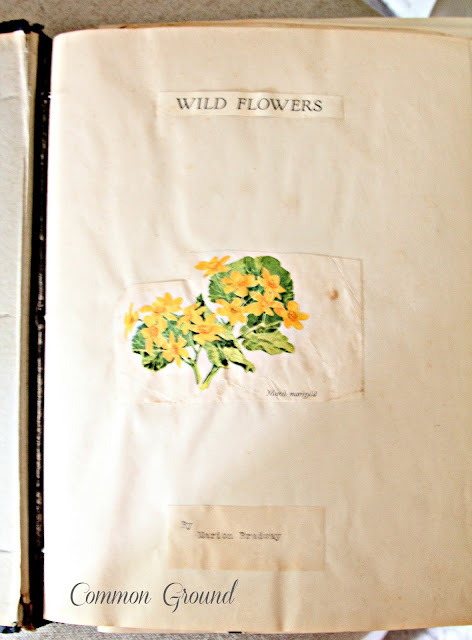 Your pressed flower pages are gems! The look beautiful on your window... so creative. They look like they were meant to be there. Thanks for sharing your lovely home at TUTORIALS TIPS AND TIDBITS. I love this - that journal was an amazing find, and the pages you picked are beautiful in the window display. sooo happy to have you share at AMAZE ME MONDAY!!! I love those botanical prints! I wouldn't have thought to us an old door with window panes. Very Creative! I came by way of Marty's link-up today. What a lovely blog you have here! I absolutely covet this piece, Debra! So unique and lovely!! Oh I just love it!! Thanks for linking up sweetie!